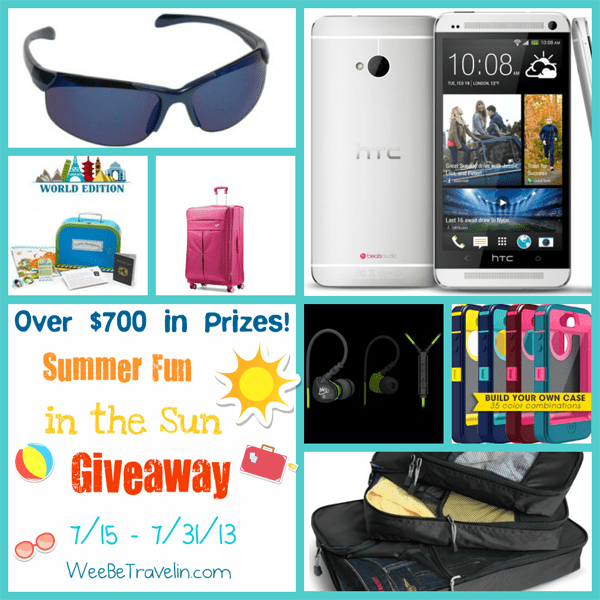 Summer Fun in the Sun Giveaway - Over $700 in Travel-Friendly Prizes! Happy Summer! Summer is the time when many of us get the bug to go on a family vacation, right? Does your travel gear need an upgrade? Have no fear, Smart Savvy Living is a member of the blogger traveling group Wee Be Travelin’ and we’re giving away over $700 in travel-friendly prizes this summer! Yep, that’s right! Prizes include the brand new HTC One from AT&T, luggage and more! One very lucky winner is going to get ALL the prizes! I’ve been able to try most of the products and they are fantastic and will be SO much help on our next traveling venture. Look for the reviews to read soon. Entering to win is easy, just use the Rafflecopter below to record all the entries you’d like to complete. Giveaway is open to legal residents of the 50 US states + DC only and ends 7/31/13 at 11:59 PM ET. Disclosure: All sponsors are responsible for fulfillment of all prizes. Smart Savvy Living and other Wee Be Travelin’ members are not responsible for prizes in any way. WDW in Orlando Florida!! :) Love going to all the theme parks. Germany would be the first. I so want to visit Disneyland! I still want to go see Alaska.